Our range of products include single column universal tensile testing machine. 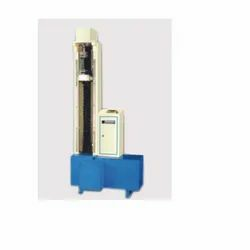 Shanta Engineering Universal Testing Machines is offering Single Column Universal Tensile Testing Machine. We are offering electro mechanical machines with digital display of load & displacement & pulley belt system for changing speeds. The machines are designed for testing various materials like rubber, plastics, cables, leather, paper, plywood and metals. Tension, compression, bend and flexural tests can be performed on these machines with suitable grips and fixtures. The machines are powder coated for an elegant look. The critical components are plated for rust prevention and durability. Facility to return of crosshead to the home position for next test. Over load & over travel, protection is standard. Grips can be selected from the wide range available for diff application. Higher load sampling frequency each. Facility to control program through a computer. All results such as peak load, elongation at Peak load, Break load, elongation at break load, %elongation at Peak, %elongation at break, Tensile strength at peak, Tensile strength at Break, Flexural stress, Compression strength, Secant Modulus, Tangent Modulus, and Flexural Modulus are directly displayed or Microcontroller as well as through PC software.